PlaySushi has been categorized as an adware program that you should remove, because the ads it displays are unreliable and dangerous. Research shows that the content promoted by the adware is mostly supplied by shady advertisers who promote their own websites. These websites might contain download links to malicious content that you should avoid downloading onto your computer. We will discuss PlaySushi in greater detail throughout this article. So if you have this application installed on your computer, please continue reading. The application is associated with the website, called Playsushi.com. This website features mini flash games that attract a lot of Internet users from all over the world. So it’s no surprise that the website’s owners have created a browser extension that users can download. The website itself features a lot of advertisements mainly associated with gaming. But our researchers say that they might be fake because the owners do not endorse the content they promote on the website or via the PlaySushi adware program. So we recommend that you avoid the website and remove the application. Failure to remove it might have undesirable consequences, since the program can promote infected websites that contains links to malware downloads. Indeed, this seemingly harmless application can open up the floodgates for far more dangerous infections to enter your PC. Your computer could be infected with ransomware that can remotely control it and steal your personal files and passwords. But, as the name suggests, it can lock up your computer, render it unusable, and demand that you pay a ransom. Furthermore, your PC could be infected with rouge applications, such as fake anti-malware scanners that pose as legitimate applications, which, after running a fake system scan, find non-existent malware that you can only remove if you purchase the full version of the fake program. These were just a few examples of what you could be facing if you allow PlaySushi to remain on your computer. Therefore, we recommend that you remove the application by following our manual removal guide provided below this article. You can also use an anti-malware scanner that will remove the infection for you. If you already have an anti-malware scanner and it does not detect PlaySushi, we suggest that you get something else, because it is very important to keep your computer protected against all threats, great and small alike. Simultaneously press the Windows key +R. Find PlaySushi and right-click on it. Find PlaySushi and click Uninstall. 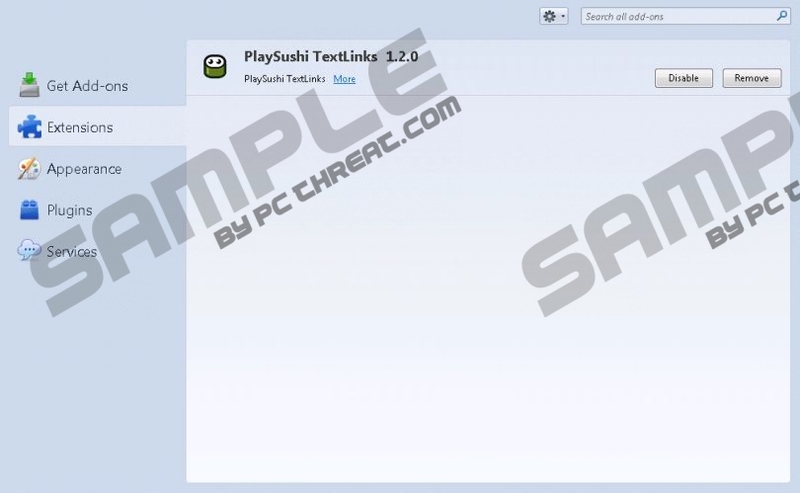 Find PlaySushi and click Disable/Remove. Find PlaySushi and click Remove. Quick & tested solution for PlaySushi removal.